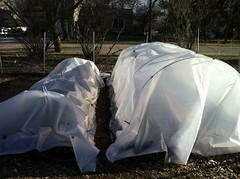 Today I made a hoop house or two. I wanted to write a fancy step by step how to blog entry, but after 14 hours of garden and family work I’m actually starting to wind down. 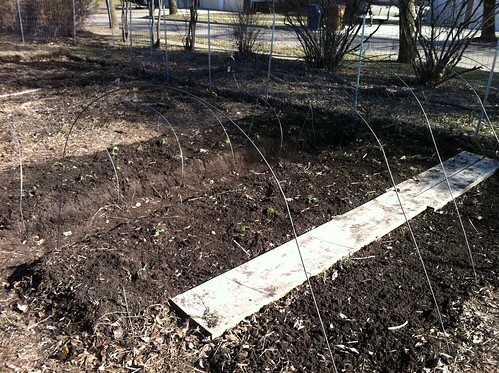 Summary: weeded, dug center trench creating two beds from one, aerated and fluffed soil with pitchfork, raked it even, dug furrow with hoe and worked in complete organic fertlizer, planted broccoli and kale, set wire hoops in soil, tarped over, clipped. It ain’t pretty, but hopefully it is functional. 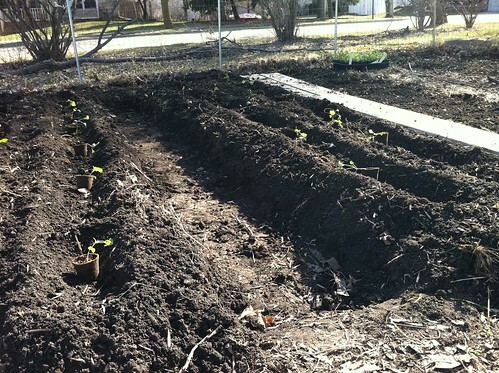 Temps were mid forties today and the soil was perfect for working but it will rain for the next few days. We may get more snow tonight. I hope the baby brassicas don’t freak out and die. I held back one flat just in case (well, also I ran out of room under the hoop houses so I have to figure out some protective device for the remaining plants). 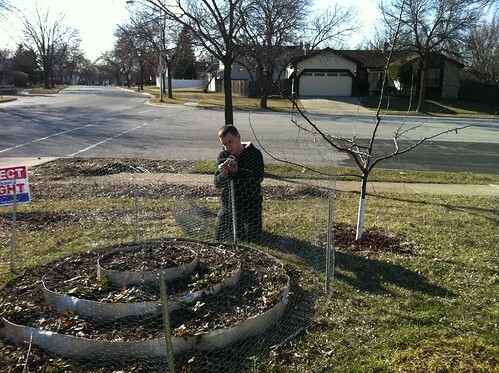 Zech put the poultry netting around the strawberry mound to save the remaining plants from the damned rabbits. Yesterday I stripped the sod from a big stretch on the south parkway. 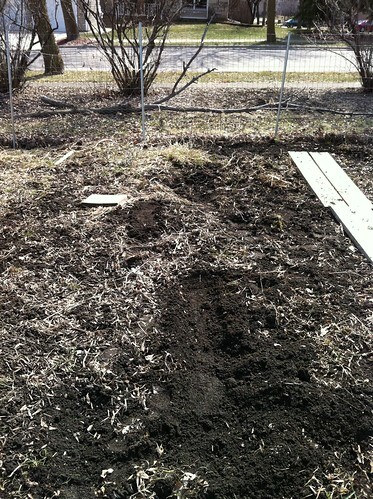 I am using it to re-sod the corners where I have ditch lilies planted because the snowplows mess up that section every year. I’ll move the plants to the new stretch, and hopefully get the mess of ditch lilies away from the corner of the house while I’m at it. Problem is the house ditch lilies are coming up now and I just didn’t get the time to transplant them. Now the ground likely will be unworkable for another week. I also wanted to throw out grass seed before the rains, but dang it there are only so many hours in the day. I need a staff! Inside I potted up a bunch more solanaceae. I am completely out of shelf and table space. Must get porch greenhouse finished immediately. Major plant-out envy. Here by the lake it’s still just too cold to risk it. xan, You should actually be warmer there by the lake. I wouldn’t try doing this without the tarps or a cold frame. You know it’s going to snow again. I’m convinced Martha Stewart could only accomplish a tiny fraction of what she does without a sizable staff. At least I keep telling myself this as I continue to knock myself out around here.